I have now completed nine months with NGIA and have had an excellent induction into the nursery and garden industry in Australia in 2015. I have a good understanding of the activities for the organisation and the key issues facing the industry to be addressed in 2016. 3. Horticulture Innovation Australia (HIA) and continuing to manage NGIA’s operation in the context of HIA transition from Horticulture Australia Limited (HAL). The key business of the AGM was the election of Directors, including the reappointment of Mike Mehigan (NGINA) also re-elected as President, Simon Smith (NGINT) and Colin Groom (NGIWA) and the appointment of Paul Lancaster (NGIQ) who replaced Tom Hennessey. Geoffrey Fuller (NGISA), Karen Brock (NGIT) and Hamish Mitchell (NGIV) remain on the Board with Hamish being elected as Vice President. National Nursery Biosecurity Program (NNBP) – NGIA has been successful with its proposal for the NNBP with HIA. The program will focus on three key area around biosecurity awareness, biosecurity preparedness and BioSecure HACCP. This is an excellent outcome for NGIA and the nursery industry for the management of biosecurity activities across the country. Communications Program – At the time of writing we were still waiting on the outcome of the expression of interest process conducted by HIA for the Nursery Industry Communications Program. 12 applications were received and HIA convened a panel to review the applications. NGIA submitted an application. HAL Legacy Projects – NGIA has eight legacy projects that were contracted by HAL that we are working to complete. It is envisaged that all will be completed by April 2016. 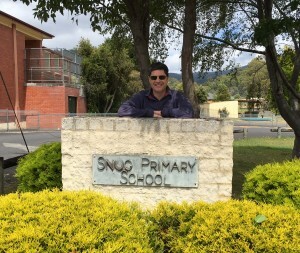 Peter making a visit to My Park Rules finalist – Snug Primary School, Hobart over the Christmas break. 202020 Vision (20V) Program – I attend a regular “work in progress” meeting for the 20V Program to obtain updates on the program and ensure it is achieving the objectives of the program. Some of the main activities being managed are Urban Forest Workshops, Media and Press Release management, Green Cities opportunities and the My Park Rules contest. Industry Advisory Panel – HIA has commenced the recruitment process to establish the Nursery Industry Advisory Panel. The Panel will be the new IAC, which will manage the consultation and advisory process on behalf of industry for R&D and marketing investments and investment strategy development with HIA. The conference program and associated activities and functions have been finalised with details available on the NGIA website. A recent addition for the conference is a Panel Session that will feature Mike Mehigan, Hamish Mitchell, David Moore (HIA), Ben Peacock (Republic of Everyone who manage the 202020 Vision Program) and I. The panel session will provide delegates with the opportunity to question and discuss industry, NGIA and HIA issues. Please contact me at ceo@ngia.com.au if you have any comments or would like to raise any issues with me.